Welcome back to week 2 of AWESOME-tober-fest 2014. This month I’m celebrating the bloody best of Fangoria magazine. Let’s start this week off with a mask ad. Ads for prop masks were not rare inside Fangoria. As a matter of fact, each issue had at least two or three ads for masks every month. By different companies. As a matter of fact I showed you a few Fangoria mask ads during last year’s AWESOME-tober-fest. Here’s an awesome color ad for some Don Post masks. 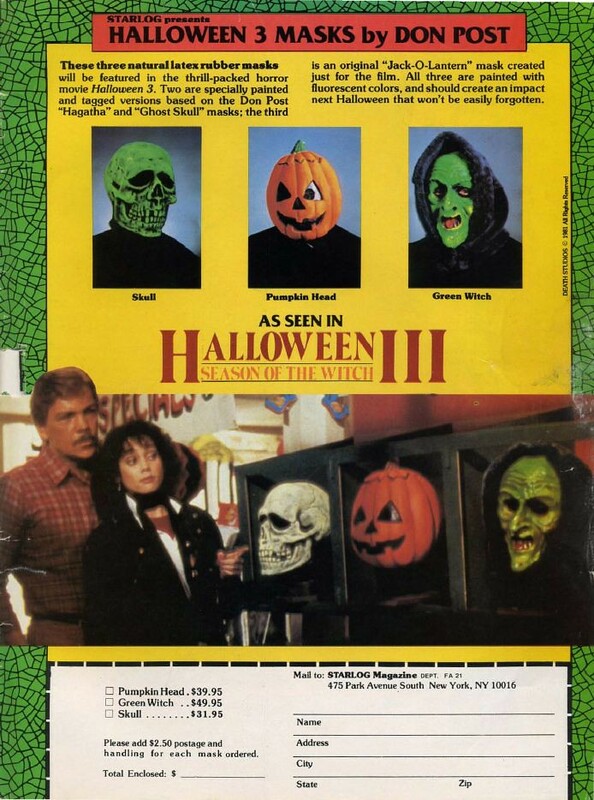 But not just any masks, they are the three Silver Shamrock masks from the infamous Halloween III: Season of the Witch. This ad was found in Fangoria #25 (1983). This entry was posted on October 6, 2014 at 8:00 am and is filed under Fangoria, Genres, Halloween, holiday, horror, magazine, movies, nostalgia, pop culture with tags AWESOME-tober-fest, AWESOME-tober-fest 2014, Fangoria, Halloween, magazines, movies, nostalgia. You can follow any responses to this entry through the RSS 2.0 feed. You can skip to the end and leave a response. Pinging is currently not allowed. I wonder if these has that cool Silver Shamrock logo on the back like in the film?